I feel really privileged to be on the design team for More Mixed Media challenges, although I feel very inadequate for the task. 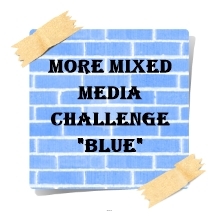 Well its finally here the start of this new challenge blog and our very 1st challenge for you is any shades of "Blue". We would like to see some where on your project a shade of Blue for this challenge so it could be the main focal colour or just a hint of the colour some where on your creation. We would love to see your mixed media work, project life spreads, digital layouts, scrap-booking, pocket letters, up-cycled projects etc. 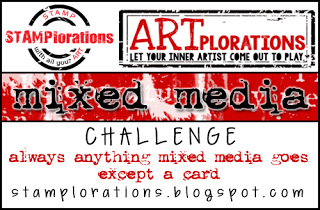 Even though we are a mixed media challenge we dont want to leave anyone out so you can enter with your traditional paper/card layouts so long as we can see the colour for each challenge. I was really out of my comfort zone doing this (and it shows in the result), but I'm still very glad to have this opportunity. I will try hard to produce something better for next months' More Mixed Media challenge. Hazel, this is amazing, I am always so in awe of the talent of crafters that can do mixed media - your canvas is truly beautiful. thank you so much for sharing this with us this time at Creative Inspirations. Lovely canvas, Hazel! Blue is one of my favs, especially in my mixed media work! Nice job! Thanks for sharing with us here at 613 Avenue Create! Hazel - you did a fab job! I love it! This is beautiful Hazel! I am not sure what you mean by doing better because this is striking! Wow Hazel! This is a stunning creation. There is so much involved. It is fabulous! This is a wonderful work of art, Hazel! Thanks for sharing it with us for One Crazy Stamper's January challenge! Congrats on joining a new DT, Hazel. I don't know how you keep up with everything!! You may think the outcome of this wasn't that good, but I think it came out fabulous!! Mixed Media really intimidates me, but I think you nailed it. Thanks for playing with The House That Stamps Built. This is amazing. Thanks for joining us at PDE Linky Party. Absolutely amazing mixed media piece! Such a delight to see! Well I don't know why you feel in adequate Hazel, this is a fab canvas. I love all of the blue tones. Good to have you stop by at Creative Artiste Challenge this month . I have to disagree with you Hazel, I think your canvas is absolutely stunning and there is no evidence that you are "out of your comfort zone". I love all the blues, black and white you have added to your project. I also love the way you created a dark, night time forest scene in the background... it looks so mysterious, but so serene as well. I love this project and think you should be very proud. Well done! Beautiful card. It's awesome that you started out the new year trying something new. Thank's for joining us in the Scrappy Moms Stamps Terrific Tuesday Challenge. What a stunning mixed media canvas! I love all the blue with the darker touches! Thanks for playing along with us over at One Crazy Stamper! Beautiful mixed media canvas, Hazel! I think you did a great job! There is no right or wrong and good for you going out of your comfort zone! Thanks for sharing it at Paper Sweeties' January Challenge! Happy New Year! This is amazing! The background is beautiful. Thanks for joining us at Tuesday Throwdown. A beautiful canvas Hazel. The vibrant blues are wonderful and the stamps look wonderful. Lovely mixed media project! Thanks for sharing it with us at Paper Sweeties! hello Hazel! Always a pleasure to see your name in the comments at Opus Gluei! I look forward to seeing many beautiful projects with you and this no exception! It's a little unnerving but exciting to stretch yourself out of your comfort zone. you've done it so well with this, I'm loving the color, and texture - a superb canvas! Thanks for coming back, I hope you never stop visiting and creating with us! Beautiful card!!! Thanks so much for participating in our WHERE THE HEART IS challenge!!! Can’t wait to see you participate again in our next challenge!! Gorgeous work! Love those snowflakes! I think you should be very proud of yourself Hazel! Your canvas is beautiful, I love the subtle feathers in the background and the blues are fabulous! Gorgeous! Thanks for linking up at Craftin Desert Divas! Beautiful work! I love your snowflakes and those wonderful blue tones! I love the layers in your piece. Gives me the chills it feels so wintery! It's great that you have stepped out of your comfort zone, but you have done it like you have been doing it for years! Your layered blue colors are just fantastic to look at, and you've created such an illusion of depth on your background. the snowflake focal image looks so frosty with the use of the foliage stamp in the back. Lovely mixed media piece! Well done; don't sell yourself short! Wow Hazel, you would never know that you stepped out of your comfort zone for this, it looks pretty freaking awesome to me! 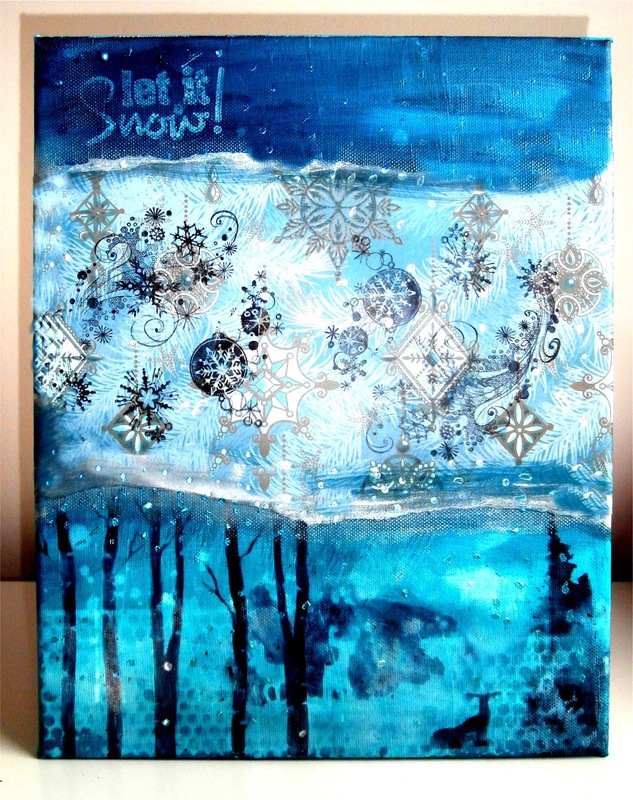 I just love how you layered all the feathers and snowflakes through the center, and the blue and black create such a wonderful contrast! This is truly an amazing piece! I do hope you will dabble with mixed media products again soon, it seems you are a natural!!!! Comfort zone or not, you need to stay in it. This is STUNNING! OMGosh, it's such a lush, peaceful scene! It looks like you tore away a piece of sky and revealed sparkly jewels behind it. 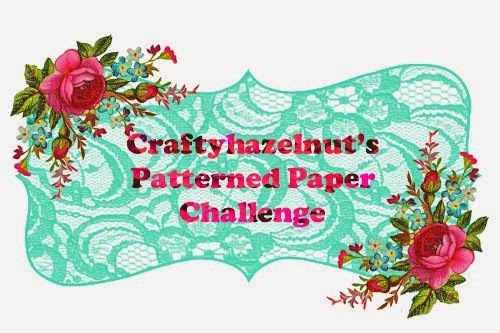 Thanks so much for joining us in the January Paper Sweeties Inspiration Challenge!